Pools that are not level may be a warning sign of problems: do this easy check yourself for levelness. Pool & Spa pop ups are costly but can be prevented. What will a pool and spa inspectors checklist include? Pool body, deck, equipment, drains, skimmers, etc. High water bills, soggy yard, cracked concrete pool deck or having to always add water to your pool are warning signs of a leak. Bright sparkling tile makes a pool look younger and more inviting. It's easier than you think. New pressure gauges start at about $5+ and take 10 minutes to install. Replacing them is just part of pool maintenance. Bonding is a little like grounding and provides additional safety for swimmers and people near the pool or spa. Bonding is a little like a double safety for pool and spa equipment, heaters and fences. The biggest safety issue with 1,000's of pools and spas is the type of drain covers. Check your pool or spa for the right drain cover. Pool slides and diving boards are great fun, but should be looked at in two ways. Should the pool deck around the pool, drain towards the pool, so you don't waste water when it splashes out, or away from the pool towards the grass? Cracks in concrete pool decks are common, however they may be a warning sign of deck problems or leaks. 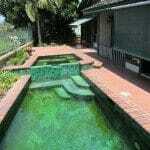 Most pool cracks are in the pool plaster, however, when through the entire body leaks may occur. The edge of a pool or spa will often have coping. This coping, if not maintained properly can cause damage. Greenish water, dirty water and chemically imbalanced water should be cleaned-up so the pools looks sharp and are healthy to be in. If you can not see clearly through the water for ten feet, then maintenance is needed. There are many easy projects that can create a look of luxury for a pool and back yard. How many have you thought of?